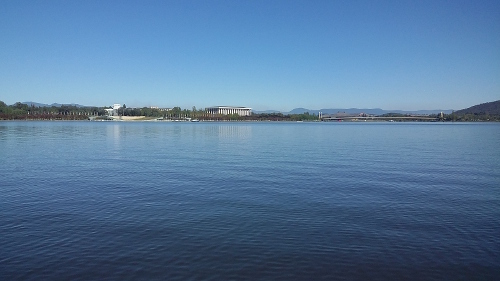 This weekend just past I was in Canberra for the annual two day walk (link), so OCA work had to fit in where it could. On balcony of our apartment, I took some inspiration from a nearby tree – lovely surface. I started with A3 bank layout paper and crumpled as hard as I could. Time passed (an afternoon stroll), then following the basic instructions in the course notes, I opened the paper about half way. and repeated the process a few more times, introducing new creases and opening to a smaller size each time. Sample p1-13a. Paper prepared, experimentation can begin. First a single rib. Sample p1-13b. Then re-crushed, and a series of ribs opened out – a couple of photos below. It looks quite different from different angles. I checked the notes and realised I should have been sketching – had to go digital, as nothing else with me. Clearly I’m at the low end of the learning curve with the software, but the exercise made me focus on edges, the textures of the crumpling itself, and the way light played on the surfaces. It was absorbing, changing colours and brush textures, size and opacity, as I tried to build up the image. Sample p1-14. I moved to an A3 sheet of 80 gsm graph paper, crumpled and ribbed. I expected the distortion of the grid to enhance the crumpling. Not so much. The paper itself was a bit soft and started to develop holes fairly quickly, and the scale and colouring of the grid just got lost. It’s just not as different and interesting as I’d hoped. The work was quite interrupted – I was travelling with others, catching up with friends… I was not feeling as positive about this exercise as I expected. I’m following a path laid out too closely, not exploring, no flow. Sample p1-13c. Re crumpled my original page and tried my earlier tree inspiration. l used a knife handle to form the “backbone”of the palm frond. The paper had a natural curl, so I went with that to choose the “top”of the frond. Disaster! I formed my palm frond, but left for the day’s walk before taking a photo. Got back – and the housekeeping service had taken my crumpled paper palm frond!!! 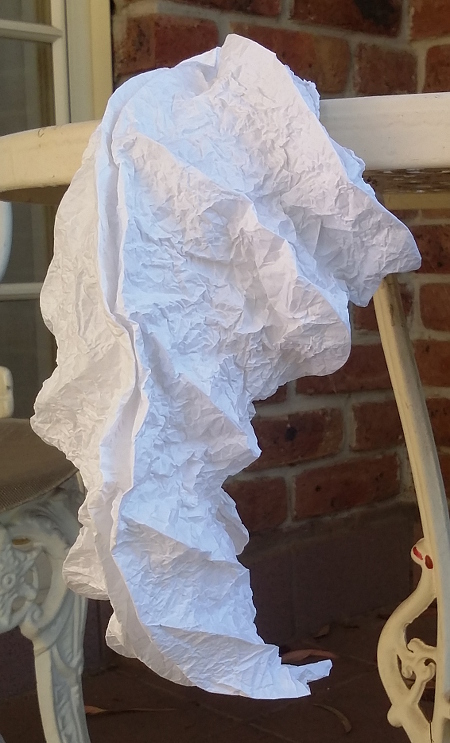 How could anyone not immediately recognise the nature of the crumpled paper as a specific, intended design? It was nowhere near a bin… I went to Reception and tried to explain the difference between crumpled waste paper and crumpled paper sculpture. I was surprised by my attachment to the single page that had accompanied me through my explorations. Sample p1-15a. I crumpled a new palm frond. I really like the way the paper naturally curves as you form it. Sample p1-15b. Next was moulding over a glass. It suggests lots of vessel possibilities, especially if one later used some kind of coating treatment (something to explore). Turning the shape around, drawing edges (and trying not to look at the screen). I was surprised by the variation in edges – little straight bits where crumpling was less dense, movement up and down, in and out as the paper overall distorted. Sample p1-15c. Then I moulded it over a different object. I’ve seen/read about the impact of colour in recognition of shapes, so offer some alternative views. It was of course a banana. Sample p1-15d. What about this one? Sample p1-15e. It’s slightly clearer when I wore (old) glasses. Back home, I was keen to get to kitchen and the aluminium foil. It was very hard to unwrap with tearing – I wasn’t entirely successful. Sample p1-16a. I decided one round of crumpling was enough for a start, and went for multiple ribs. Sample p1-16b. 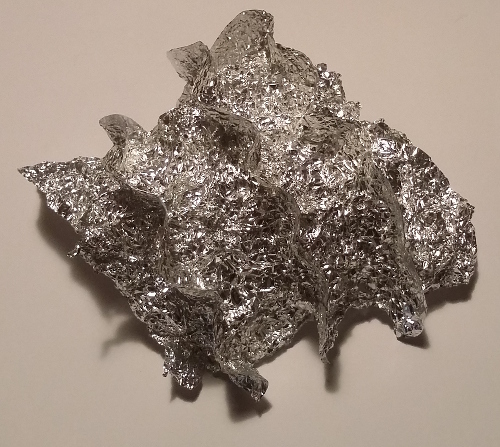 It’s exciting how well the foil holds shape, so I added some waves – which were entirely lost visually. Sample p1-16c. Perhaps smoothing on the folds so that there was a clearer difference in texture would help… Yawn. Not enough. Sample p1-16d. Then a simple mould around a glass. I am convinced there are possibilities here, but I’m not reaching them. Perhaps a heavier gauge foil would be better. I’ll return to this later. Sample p1-17. Going back a bit to the graph paper that was blah, I tried a stronger pattern – some Christmas wrapping paper, around A3. The crumpling. By the end any gloss of the cheap paper was gone. Sample p1-17a. This time I tried for a spiral folding. As I was working the soft paper seemed to be losing all its creases, but when put on the work surface it is quite 3D. Sample p1-18. I wondered if the initial crumpling was really making a difference on this paper. I cut a fresh piece and tried a spiral fold. Conclusion – the crumpling does make a difference! Finally, working on these projects has sharpened my eyes. 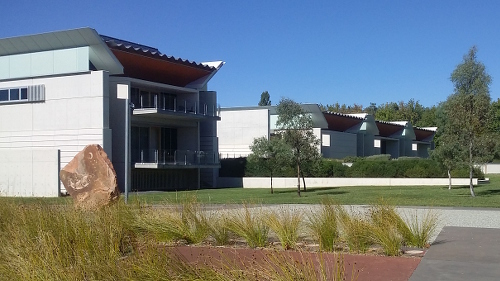 Some pleats and surface folds seen while walking in Canberra. The paving around the lake. The roofline of the National Portrait Gallery. The Cascade Waterfall by Robert Raymond Woodward AM, leading up to the High Court.